Facebook marketing is a great way to engage with your current audience as well as tell your brand story, and shows your industry expertise to your untapped target market. 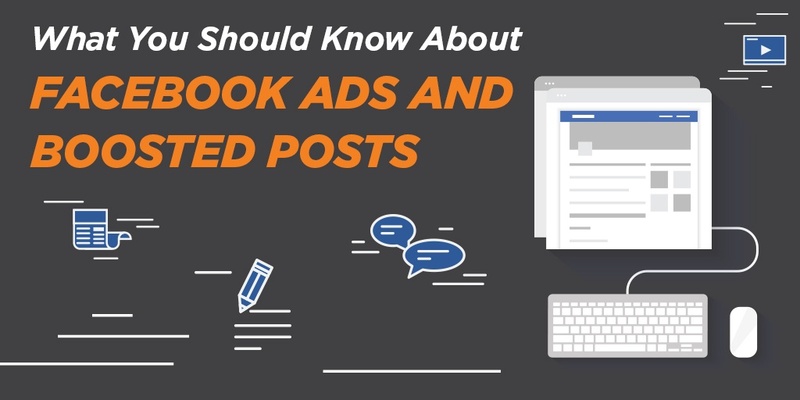 Using Facebook ads and boosted posts is a great way to get in front of your entire audience. Not only will being active on Facebook grow your audience base and customers, it will help to engage with them and build a group of fans or brand evangelists that love your brand. Facebook is the best marketing platform online that allows you to drill down to the exact interests, locations, salaries, job roles, and other demographics to get your message in front of the right people. Facebook has come a long way since its beginning and now is mostly in a pay-to-play market where you have to boost your posts or pay for ads to get them seen on Facebook news feeds. 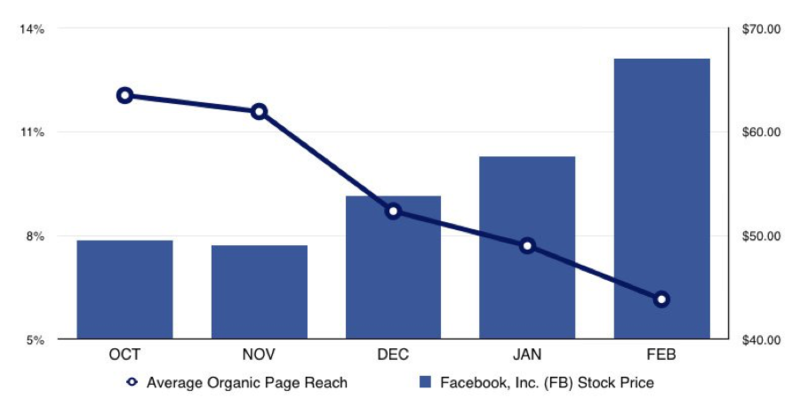 This chart shows that as Facebook’s business grows, thanks to paid advertising, it is becoming harder and harder to show up organically in the Facebook news feed, which is down to 1% in some cases. It makes sense that as more and more businesses are competing to get in front of current and potential customers that it is costing everyone more to do so. To earn the trust of your target audience you need to give them helpful, resourceful, and sometimes entertaining content. People tend to connect better with brands when you solve a problem for them or show them value. Boosting posts will help to get your content on the news feed of the audience you choose, whether it's current people that like your page, friends of those that like your page, or an audience that may have never heard of you. Think of your own Facebook news feed… it probably consists of posts and pictures from your family and friends, ads from other businesses, and posts from pages you like and that your friends share. If you want to add in your sponsored posts, you need to make it worth it for them. You need to boost Facebook posts with the right calls to action so your audience knows the next step to take. Your goal could be to get more visits to your site, download content, or buy a ticket for an event. Whatever your goal may be, make sure your CTA reflects it. Getting likes, shares, and engagement from your Facebook posts will help to grow your audience, increase traffic to your website, and help towards building trust with your brand before your audience becomes a lead or buys from you. Having a Facebook business page with outdated information can lead customers in the wrong direction and potentially lose them for good. Not having a Facebook page at all can lead them to think that you are no longer in business. Just having a Facebook page that isn’t active can lead to the same conclusion. Not only do you want your Facebook page to look active and engaging, you also want to optimize it with the best navigation choices and calls to action. Another way to optimize your page is to have exactly the same name, address, and phone number as you have on your website and other directory listings. This is extremely important as data aggregators and Google will use this information to determine if you are a legitimate business entity. Anything from a missing period to spelling out a street name in full (or abbreviating it) can create discrepancies between your other listings. Make sure all of your listings are spelled and formatted in the exact same way to avoid problems. Ultimately you want to grow your Facebook page fans so that as you share more content, the higher the chance of it showing up organically in their news feed and sharing it with their friends and followers becomes. Promoting your Facebook page is always essential, which is why optimization is key. Do you want to create awareness and improve your reach to your audience, create a consideration stage that gets you traffic, views, and engagement, or increase conversions? Ads are set up according to what goal you have, and there are many different designs your ad could have. You can use photos, videos, or a mix of both in carousels and slideshows. A lot of businesses prefer to use Facebook ads for conversions, but since you are only paying for a conversion, these cost more than just getting impressions and views for your ads. It all depends if you are trying to grow your audience and awareness, or if you want someone to download a piece of content to put them in the consideration page, or if you want them to buy or call you now and convert into business. 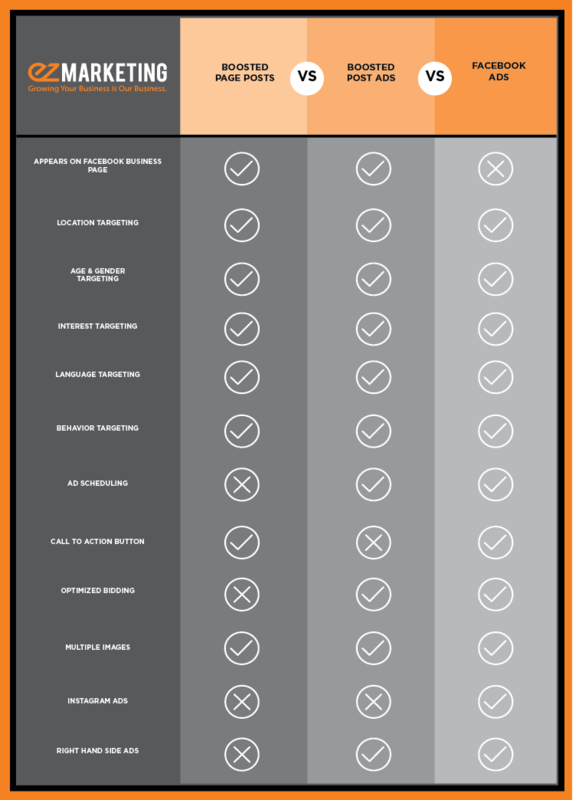 This chart shows that Facebook ads allow for the best targeting options, most features, and options for advertising, and allows you to also advertise on Instagram, which is owned by Facebook. It’s also important to split test to see what your audience reacts to the best. It can be running the same ads to the same target audience but with a different image or a slightly different message or call to action to see which performs better. 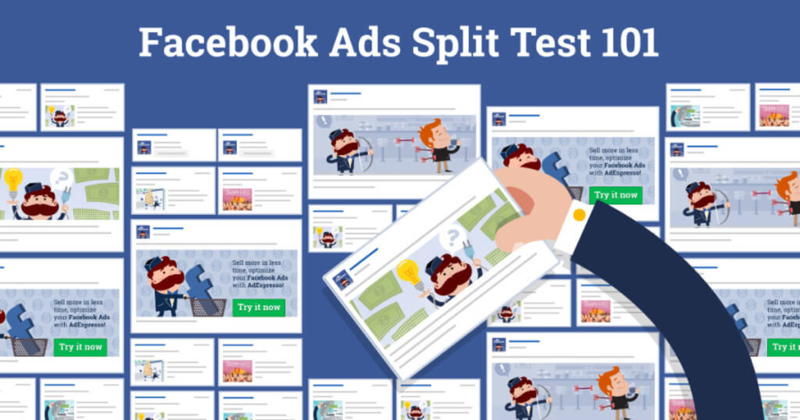 Once you have enough data to determine which campaign is doing better, you pause the latter and rinse and repeat by starting a new split test campaign. This allows you to accurately and definitively determine, with data, that certain campaigns are performing better than others so you know where to focus in order to reach your goals. What good is it if you aren’t tracking everything you are doing on Facebook? If you are making money or increasing leads, but don’t know whether they came from Facebook ads or boosted posts, then it isn’t going to benefit you as much as it could be. By tracking links and getting advanced reports on your campaigns, you know what is working and what isn't. This way, you can spend more time and money on what is working to increase your ROI while performing fewer ineffective tactics, or outright stopping whatever isn’t working.